Though the Targaryen dynasty was overthrown by Robert the Usurper, there are many in Westeros who wish to see House Targaryen restored to power. These loyalists pledge false fealty to their current overlords as they wait for the opportune moment to reveal their true allegiance. In Mother of Dragons, that moment has come, and the goal of House Targaryen is to uncover and rally their Westerosi supporters. House Targaryen does not acquire victory points in the same way as other Houses, who must conquer castles and strongholds across the realm. For House Targaryen, the victory track records the number of Westerosi supporters they have gained, marked by loyalty tokens placed on the board. Yet they must still patiently wait for these loyalists to reveal themselves, allowing the dissatisfaction and mistrust in Westeros to fester. 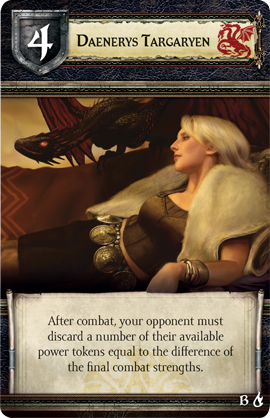 This new factor in the turning world of Westeros appears during the Westeros Phase, drawn from a new deck of Westeros IV Cards. 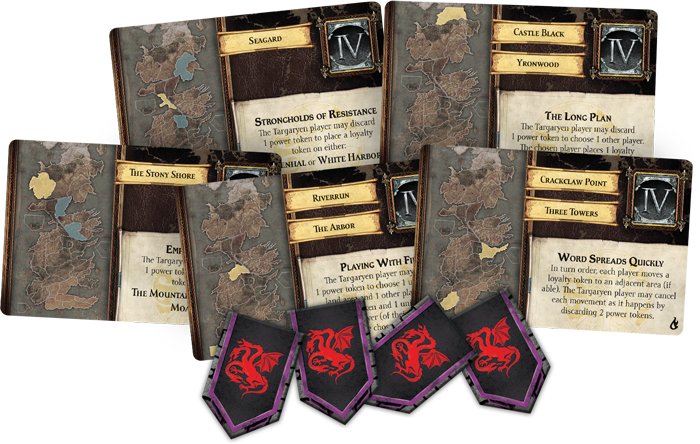 The Westeros IV cards reveal new allies for the Targaryens by placing loyalty tokens around Westeros, and they may also allow the Targaryens to order their loyalists into new territories, stirring thoughts of rebellion in an ever-larger region of Westeros. 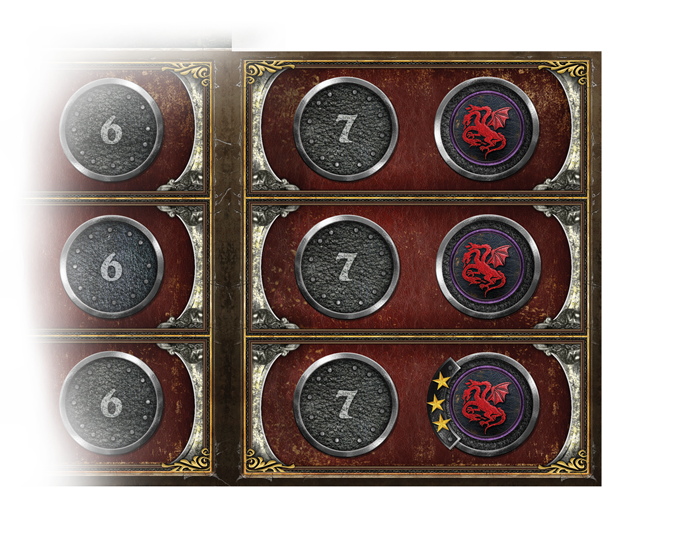 These regions with loyalty tokens are the regions that House Targaryen must conquer to gain victory points and win the game. Loyalty tokens do not affect the other Houses—such dangerous loyalties must be kept secret, after all—but they also cannot be removed. If House Targaryen can rally their forces and gain control of an area loyal to them, they permanently gain the loyalty token and move one step closer to victory, even if they later lose control of that space. If House Targaryen reaches the seventh space on the victory track, they immediately win the game. But to declare loyalty to a powerless House across the sea is a dangerous venture. If House Targaryen wishes to bring new followers to their cause, they must present some grand, almost divine reason for them to do so. This reason comes in the form of the leader of House Targaryen, Daenerys Targaryen, who has defied death and brought magic back to the world. 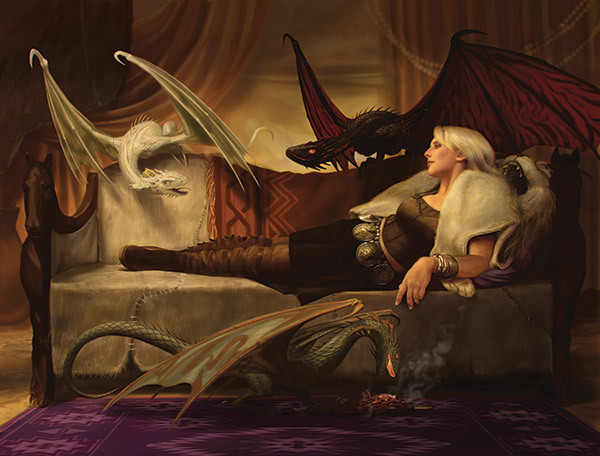 Across Westeros and Essos, Daenerys is best known as the Mother of Dragons, giving her House access to three mighty dragons, which are the most rare, unique units in A Game of Thrones: The Board Game. A dragon is no slave, nor is it a soldier. As such, it cannot be mustered normally. House Targaryen begins with three dragons in play, and that is all they will ever have. If one of these creatures is killed, they cannot be brought back from the dead. In addition, each dragon is a living, breathing creature that grows stronger as the game progresses. As hatchlings when the game begins, the dragons have a combat strength of zero—they must be carefully kept out of combat and protected. But each time the round marker advances to a space with a dragon strength token, the beasts' strength increases by one, recorded in the Dragon Strength tracker at the bottom of the Essos board. 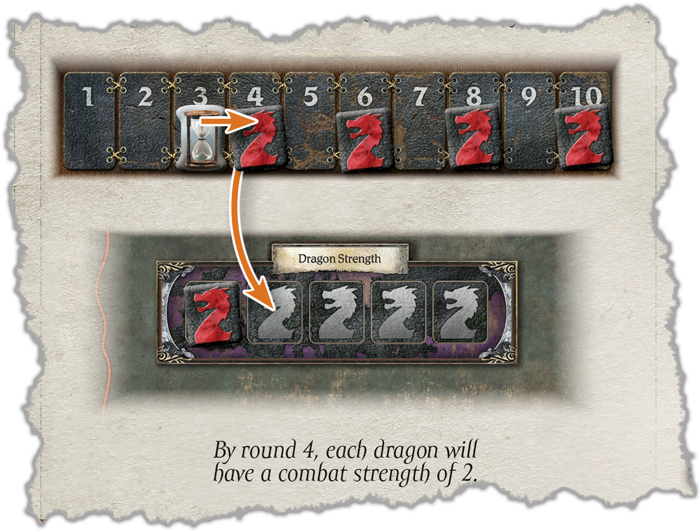 If their growth is left unchecked, all three dragons will reach the incredible strength of five by the last round of the game! 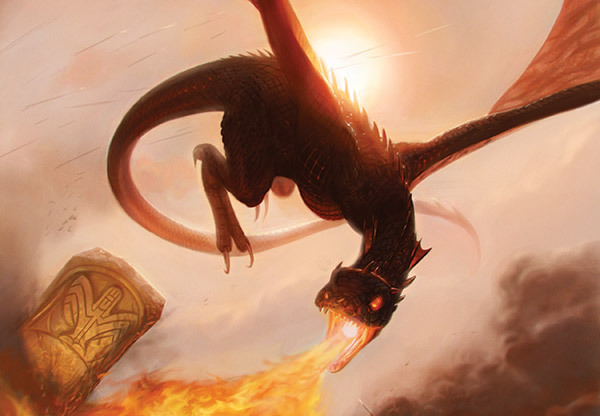 Your dragons can fight alonside your armies as you move from Essos and sweep across Westeros, but unlike any other land unit, dragons also have the power of flight. With a simple march action, you can move your dragons to any land space in Essos or Westeros! If this area is occupied by an enemy unit, they initiate combat as normal. Still, you must be careful not to let your dragons become cut off and destroyed in enemy territory. Even Aegon the Conqueror knew that simple strength was not enough to hold the realm for long. As any noble of A Game of Thrones: The Board Game knows all too well, it's not enough to play the game of thrones on the battlefield. You must also master the shadowy intrigues of court—forging and breaking alliances, making deals and granting concessions, all while knowing that those you bargain with are the very people who wish to destroy you. Mother of Dragons elevates this aspect of gameplay with House Targaryen’s inability to advance their own agendas in the courts of King’s Landing. 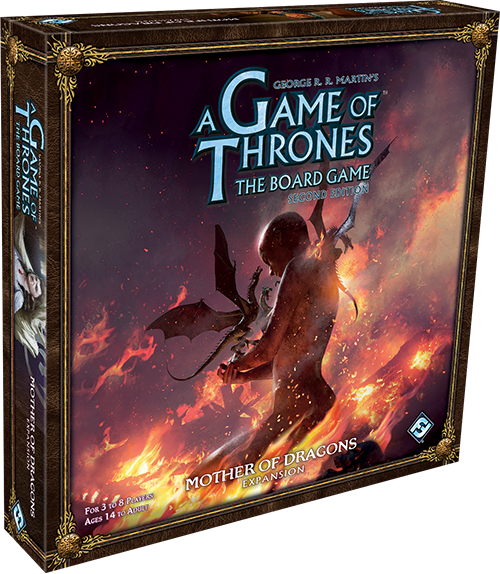 As outsiders and expatriates, House Targaryen permanently occupies the eighth space on all influence tracks for the entire game. They can still use three special order tokens each round, but their true power comes from their ability to influence the disputes between the other Houses. 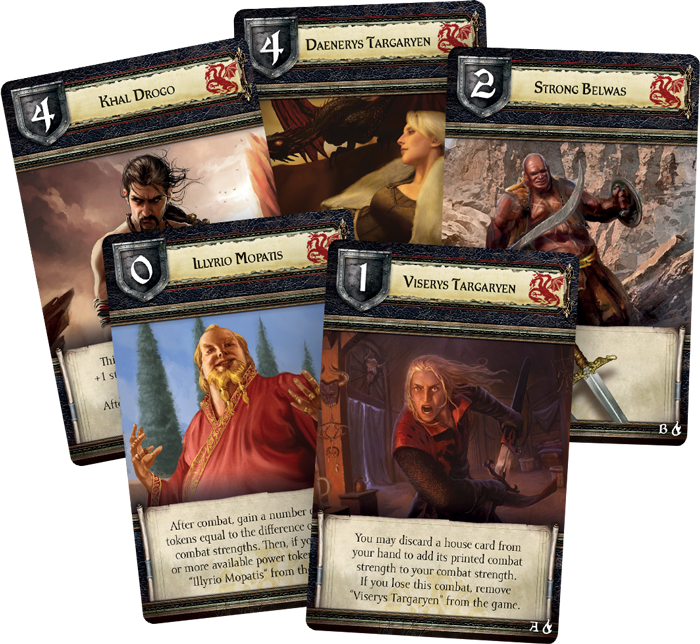 When players bid on influence, House Targaryen also bids on the three influence tracks, committing any number of power tokens. However, once all bids are revealed, House Targaryen must distribute their power tokens among the other players, increasing those players' bids for influence! With this dramatic ability to tip the scales, House Targaryen is a powerful ally for any House, but also a deadly enemy if they have been betrayed. Outside of the Westeros Phase, the members of House Targaryen are not the only ones who can use their power to influence the actions of others. In Mother of Dragons, players can freely give power tokens to other players as an… incentive to see things from your point of view. With this new bargaining tool, the battle for the Iron Throne takes on a new form. Will you maintain your hold on power when you must forge alliances, and will you dare to break them when the consequences of betrayal can spell doom? The remnants of House Targaryen have lived in hiding for years, quietly gathering their strength and waiting for the day when they could return to Westeros and reclaim the throne. Now, with King Robert dead and Westeros thrown into chaos, the time has come to cross the sea and follow in the steps of their ancestor Aegon the Conqueror, ruling the realm with fire and blood!